Russia's president has said tax inspectors should not "terrorise" firms, and that the country's tax regime needs to improve. President Vladimir Putin's annual state of the nation speech also stressed the need to persuade Russians to stop salting away their money abroad. The economic policy portion of his speech aimed to reassure foreign investors by promising clearer rules. Mr Putin suggested a three-year time limit on back tax claims. But much of his wide-ranging speech was also aimed at encouraging Russians to support the economy by investing at home. His remarks ran the gamut of macro-economic issues from taxation policy to the need for Russia's breadwinners to drink less and have more children. "Ways must be found of recovering tax arrears for the past years that would meet the interests of the state, but not ruin the economy, or make businesses feel cornered," Mr Putin said. "The tax authorities have no right to terrorise businesses with repeated inspections." He said it was "only fair to admit that our tax system was merely finding its feet over the past few years". He added that tax inspections should focus on making sure companies and individuals comply with the law, and not on meeting targets for taxes collected. 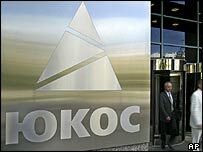 Foreign investors were alarmed by back tax claims totalling $27.5bn against oil giant Yukos. Other firms to face significant, though smaller, back tax claims include TNK-BP, the Russian joint venture half-owned by British oil group BP, and Russian oil firm Sibneft. Yukos' main production unit was auctioned off by tax bailiffs - and eventually passed back into state control - to cover massive back tax claims. Mr Putin said it was right to favour Russian control of some economic sectors but the "rules of the game need to be very clear". Yukos' ex-boss Mikhail Khodorkovsky is on trial on separate tax fraud charges and could face ten years in jail when the judge gives her ruling on Wednesday. 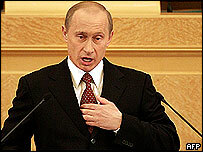 Mr Putin also stressed the need to coax Russian wealth back into Russia. Many rich Russians have taken their assets abroad - notably Sibneft tycoon Roman Abramovich, who has poured part of his fortune into Chelsea football club. Mr Putin said tax rules should be stripped down to make declarations of back tax "very simple", based on a standard 13% rate of income tax and repatriation of funds into Russian bank accounts. In particular, he suggested that abolishing inheritance tax might help bring back "fortunes running into billions of roubles" from abroad. He called for a national strategy to tackle drunkenness by encouraging "sports and physical fitness" among young, male breadwinners, though he questioned the value of bans on advertising alcohol. Russians need to have more children and to take more pride in educating them, he added.